The new Club officers (elected in December 2015) started the semester by representing BHEC at the Spring 2016 Activities Fair. 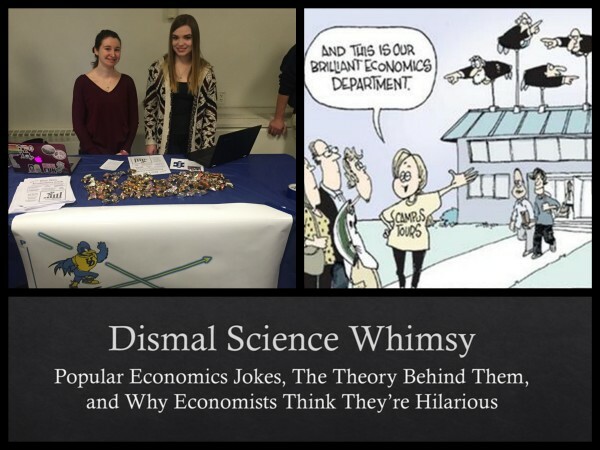 At the first semester meeting, Prof. Butler gave a presentation entitled, “Dismal Science Whimsy: Popular Economics Jokes, The Theory Behind Them, and Why Economists Think They’re Hilarious”. Members socialized and discussed plans for the semester, including the upcoming Environmental Case Competition. Planning for this year’s Case Competition is already underway, and it promises to be bigger and better than last year, including larger prizes, more co-sponsors and cooperation from the Sustainability Task Force which will consider implementation of the 1st place proposal. The Club is also strengthening its tutoring initiative this semester. Sessions are already scheduled for Mondays in March, where volunteer tutors are helping undergraduate students prepare for midterm exams. See the Club’s new Tutoring Page for more information!